NEWPORT BEACH — Orange Coast College Sailing Association (OCCSA) hosted its annual Catalina Rendezvous to the Isthmus at Two Harbors last fall — and more than 20 OCCSA members, friends and family members participated, sailing aboard five vessels. All of the skippers and most of the crewmembers participating were OCCSA members. The vessels left from various local harbors to rendezvous and enjoy the moorings at Two Harbors. The fleet’s five boats included a Catalina 36, Utopia, skippered by Commodore Eric Walther with a crew of Guy Adams, Kathleen Winnie and William Ramlo. Kirby Holte sailed Uff da, an Ericson 32, with a crew of David Malson and Andy McVay. Rich Detwiller sailed a Catalina 30, Lucky Lady, with a crew of Doug Maddox, Mouse Marse, Geri Marse and Krista Vann. Eric Gritzmacher sailed a C&C 38, Cool Man Cool, with a crew of Terri Gritzmacher, Eric Stoller, Teresa Fry, Toby Jackson and Jeff Peiffer. John Dillon sailed a Hunter 33 with a crew of Roxanne Culpi, Dan Hayes, Kathy Ahmason and Terri McLaughlin. During the voyage to Catalina, the crews practiced seamanship and navigation skills learned at OCC. There was brisk sailing on Friday, and everyone arrived safely at the moorings by late afternoon. On Saturday, some of the sailors enjoyed a little solitude and a good book on a peacefully rocking boat. A few found time to hike the trails that fan out from Two Harbors. Some sailors brought or rented kayaks for a little paddle in the harbor. By afternoon, rendezvous organizers moved supplies to the stage area for a Saturday evening barbecue. 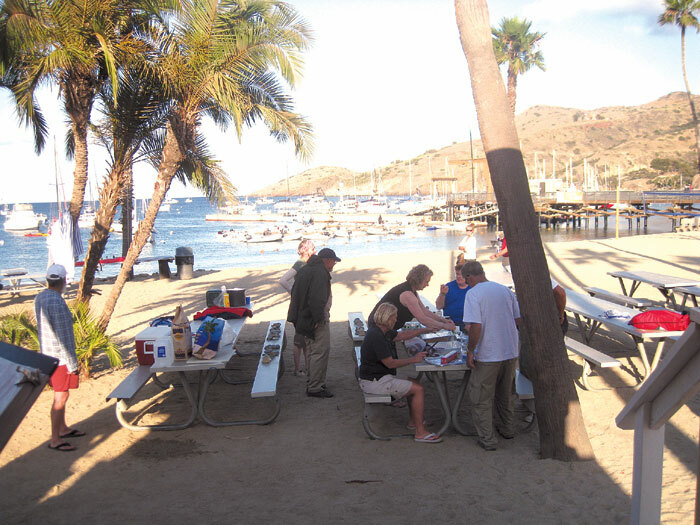 Catalina Rendezvous participants gathered at the main stage area and brought potluck dishes to share. The barbecue pits began to blaze and music started, provided by OCCSA member Mouse Marse, who played his guitar and sang a wide variety of songs. After the barbecue, there was an awards ceremony — and trophies were given out in the following categories: Navigator, Captain Ahab, Best Beverage, Longest Passage and First in the Water. After the festivities, everyone helped clean up and went back to their boats for a restful evening. The fleet departed Two Harbors for their respective home harbors at 10 a.m. Sunday. With this kind of fleet sail, OCCSA organizers hope to open up a new avenue of opportunities for member sailors. This kind of experience, in a controlled, instructive atmosphere, is designed to build participants’ confidence in offshore sailing. OCCSA was established in 1995, and the group’s first organized fleet sail to Catalina was held in October 1995. While education and sail training remains the core of OCCSA, the group is also involved in community service, volunteerism and social interaction. OCCSA’s meetings are held on the last Monday of each month at 7 p.m. at the OCC Sailing Center, 1801 W. Coast Highway, Newport Beach. These meetings are designed to incorporate an educational component, frequently involving a guest speaker. OCCSA’s monthly newsletter, Sail Away, is published to announce future events and discuss past events. Even beginning sailors are invited to join the association for a small initiation fee and immediately reap benefits — such as a 10 percent discount on rental of Lido 14s, 30-foot Shields, Harbor 20s; and discounts on some evening classes. OCCSA plans summer regattas for Lido 14s, Shields 30s and Harbor 20s. Members also enjoy social events, family style barbecues and placement on crew and skipper lists to promote sailing opportunities. OCCSA members can charter Lido 14s, Shields 30s and Harbor 20s for day sails after gaining experience, and passing practical sailing tests and a written test. The sailing association has been affiliated with the Southern California Yachting Association, which will allow members to participate in SCYA-sponsored races and events, as well. OCCSA has recently become a chapter of the International Order of the Blue Gavel, which is an organization recognizing past commodores and promoting yachting and sailing around the world. For additional information on sailing opportunities, classes or OCCSA membership, call the Orange Coast College of Sailing and Seamanship at (949) 645-9412 or visit occsailing.com.